A tern combs the beach for food as the sun rises August 13, in Grand Isle, Louisiana. Efforts this weekend to salvage BP's blowout preventer could bring to the surface a key piece of evidence in the inquiry into the largest maritime oil spill in history. Efforts this weekend to salvage BP's blowout preventer could bring to the surface a key piece of evidence in the inquiry into the largest maritime oil spill in history. US spill chief Thad Allen said Friday that efforts to "fish" out pipes near the massive valve had failed so far and "it was decided that we go ahead with the removal and replacement of the blowout prevent" over the coming days. Allen said investigators from the Justice Department will be present to examine and preserve the blowout preventer as evidence. The device failed to shut off the gushing oil as designed when an April 20 explosion ripped through the BP-leased Deepwater Horizon rig, killing 11 workers. Two days later the platform sank and an estimated 4.9 million barrels of crude leaked from the Macondo well until it was capped on July 15, too late to stave off environmental disaster in the Gulf of Mexico. Although BP has committed to pay billions of dollars in damages from the spill, it remains unclear whether the British oil firm, its drilling partner Transocean, oil service company Halliburton, which performed crucial work on the well, or Cameron, the manufacturer of the blowout preventer, face the greatest liability. Allen said the removal was somewhat delicate because the device still had pipes attached to it and was connected to the equipment that is capping the well some 1,500 meters (5,000 feet) down on the sea floor. He said the removal would begin with a "gentle tug" applying up to 80,000 pounds of pressure to see if the blowout preventer comes free. If not, crews will then seek to cut some of the pipes attached to lift out the device. Allen said the installation of a new blowout preventer would likely begin on Wednesday, weather permitting, and that plans to permanently seal the damaged well were on course for early September. The "bottom kill" involves intercepting the crippled well with a relief well, which then pumps heavy drilling oil and cement into the oil well to permanently plug it. Originally scheduled for mid-August, the bottom kill was postponed to start around September 7. The ruptured Macondo well was capped on July 15 and earlier this month BP engineers performed a "static kill" which plugged it with heavy drilling fluid and then sealed it with cement. However, there is an area between the well and the outer well bore called the annulus which must still be sealed off from the reservoir miles below the surface of the Gulf of Mexico. 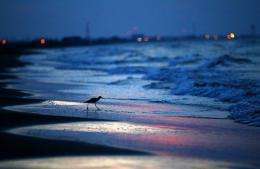 In a related development, US authorities reopened 4,281 square miles (11,000 square kilometers) of Gulf waters off western Louisiana to commercial and recreational fishing. The reopening was announced by the National Oceanic and Atmospheric Administration after consultation with health officials. Because much of the oil has dissipated or been captured, officials said the area is at a low risk for contamination. "Scientists, food safety experts, members of the fishing industry and local, state, federal officials, are working together every day to ensure that seafood from the Gulf is safe to eat," said Jane Lubchenco, the NOAA administrator. "We will remain vigilant and continue to monitor and test seafood in reopened waters."